Well, the Amityville Horror supposedly took place in Amityville on Long Island, so that makes sense. Have no idea what The Village is. But below is what most of New York State looks like outside the cities (about 40% of New York's population lives downstate in the NY Metro area). I don't see the "creepy". The difference between LI's and OBX's beaches is laughable. I also enjoy the Smokies over the Adirondacks. Warmer weather = more hiking. There are lots of great places in NY, I just prefer NC. You do realize that NY has beaches outside of LI? 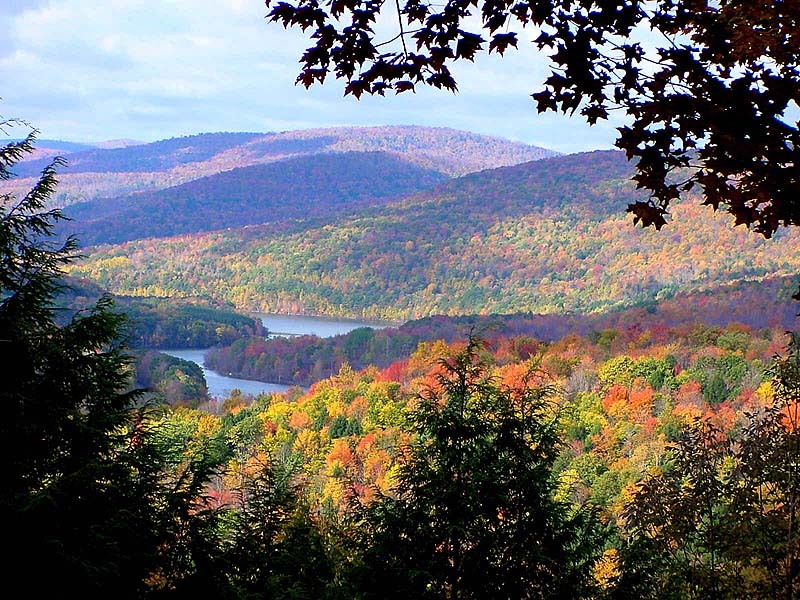 You forgot about the Catskills and other smaller mountains like the Enchanted Mountains in WNY. There are places like Niagara Falls, the 1000 Islands, the Finger Lakes, Howe Caverns, the Base ball Hall of Fame, 2 Great Lakes, plenty of wineries, good college and pro sports, the oldest continuous running state fair in the country and more. No big deal though. i know a lot about nc, thank you. i just know what i prefer and why. one could live in va and be in the dmv area and it trumps anything in nc IMO. and you have your sports teams (redskins, wizards, nationals). for me personally, professional sports > college sports. i understand that in nc its completely different. b/c nc historically never had pro sports up until the past 15 years or so w/ exception of charlotte hornets, which had so much support they lasted an amazingly long, 14 seasons. So for them to tout pro sports when the DC teams have been there forever with a national fanbase and long history in the redskins, is kind of a non argument...and if smaller towns are your thing, I would have to say Charlottesville trumps anything in NC. If this is going to turn into a VA NC argument, the DC metro has to come into play as places like Arlington and Alexandria are there. If other "southern" towns come into play, it is hard to discredit somewhere like Richmond over say, Raleigh or Charlotte. If beach towns come into play, it would be hard to beat Virginia Beach area. So as you said, for that "scene" and "experience" especially for somebody coming from north of VA, there wouldn't be THAT compelling of a reason to go to NC when you can do similar, and arguably better exploration in VA.
Last edited by grapico; 04-22-2011 at 02:55 PM.. I do not watch reality TV, nor have I ever watched a show called Simple Lives. I do not see how your strange, shrill obsession with reality TV stars and Paris Hilton has any relevance to the topic at hand. I'm equating them with your logic and what little you know about the reality of rural America and the boogieman mentality of it all being creepy. Total fallacy. Laughable? I know the North Carolina coastline is alot bigger than Long Island so even I, a Long Islander, would admit that NC wins the beach contest (ocean beaches anyway). But I still think Long Island beaches are no slouch either. I mean did you ever hear of the Hamptons, Fire Island and Montauk? And some of our beaches are considered in the top ten beaches from time to time. Not bad for a Island only the size of the State of Rhode Island. So I agree with you that North Carolina has a better ocean coast but please don't say our Long Island beaches are laughable. As for the Smokies and the Adirondacks, I am going to disagree with you. I love The Smokies and they ARE great, they really are the Great Smokies. But you can fit the entire Great Smoky Mountains National more than TEN TIMES into the Adirondack Preserve. In the Adirondacks you also have whitewater rafting (even in the summer) and 3,000 lakes and ponds, including a bunch you probably heard of Lake Placid, Lake George and Lake Champlain. You can go on week long canoe camping trips because many of the lakes are interconnected. There are interesting sites like Ticonderoga, Fort William Henry, Crown Point and nearby Saratoga Springs. You also get a interesting mix of American and Canadian visitors, many of them from nearby French speaking Quebec. Sounds like you know next to nothing about NC if you think that it doesn't offer anything that VA doesn't. For starters, you've got major league pro sports, one of the best college basketball scenes in the nation, the Outer Banks, Asheville, etc. Surely VA has its own unique offerings as well, but I don't know where "far more" is coming from. I actually like both North Carolina and Virginia and both are in my top 10. Both states are diverse and actually are pretty similar, with a coastline, tidewater, piedmont and mountains. Virginia is actually my third favorite state after New York and Pennsyvania. I am a history buff and IMHO Virginia beats every other state in that, including both NY and NC. Although I admit, Virginia could use some bigger cities (and not just more Washington DC suburbs) and some pro sports teams. i feel like nova alone offers more than nc. again, my opinion. You can have an opinion; just realize that your's is not based on facts. But we're not comparing NC and DC. We're comparing NC and VA. None of the DC region's pro teams are in VA. VA has no major league pro sports teams. That's just the fact of the matter. ...and if smaller towns are your thing, I would have to say Charlottesville trumps anything in NC. Chapel Hill gives Charlottesville a run for its money, and Asheville just flat out beats it, hands down. Start a poll if you don't believe me. If this is going to turn into a VA NC argument, the DC metro has to come into play as places like Arlington and Alexandria are there. Yes, but none of the amenities that were mentioned have a presence in Arlington and Alexandria. Truth is, aside from the Metro, NoVA is just a cross between Charlotte (tons of office space, fair share of sprawl, malls), Raleigh (hi-tech economy, high educational attainment, malls, sprawl), and New Bern (colonial town like Arlington and Alexandria). If other "southern" towns come into play, it is hard to discredit somewhere like Richmond over say, Raleigh or Charlotte. Not discrediting Richmond, but one cannot simply dismiss Charlotte or Raleigh which are larger and faster-growing cities with more robust economies--and pro sports (plus college basketball for the Triangle). If beach towns come into play, it would be hard to beat Virginia Beach area. Depends on the type of experience you want at the beach. For instance, Virginia has nothing like the Outer Banks. As a matter of fact, very few states have anything like the Outer Banks, whereas one can get a VA Beach sort of experience in places like Myrtle Beach, Ocean City, Rehoboth Beach, Atlantic City, etc. So as you said, for that "scene" and "experience" especially for somebody coming from north of VA, there wouldn't be THAT compelling of a reason to go to NC when you can do similar, and arguably better exploration in VA. True, but the OP asked about living in the states being compared and not simply visiting. There's a reason why NC is bigger and growing faster than VA. I'm not taking anything away from VA whatsoever because I could definitely see myself living there and it has much to offer, but I'm just pointing out the facts. ALL of my posts in this thread, as they relate to NC and VA specifically state that its my opinion and/or imply that its my opinion. reread all of my posts in this thread. i don't see how anybody would think that i was trying to pass of my personal opinion as fact(s) unless they skimmed my posts. i meant the VA side of the dmv. i'd rather live there than any part of nc. thats just me, tho. what is the third major league team in nc? panthers, bobcats and...? oh, you mean hockey. well...yeah...i don't follow hockey a lot, lol. dc has the capitals, which if you live in nova you'd have access to. again, the college scene is good as well. i feel like nova alone offers more than nc. again, my opinion. just like i feel like nyc alone carries the state in this topic, although obviously ny has more going for it than just nyc. if anybody here thought i was trying to pass off my opinion about VA being better than NC as fact after reading the bolded words, which are included in each of the posts in this thread, then they need to learn the concept of reading comprehension.